Domino's, the world leader in pizza delivery, arrives in Italy and offers a new and unique product to the Italian market, on top of an innovative, fun and captivating experience to all consumers. After examining all the elements of the brand, we defined a positioning that could convey Domino's world: a whole new pizza, a whole new experience. When defining the App and the communication around it, we focused on a creative concept: the Unexpected. Unexpected is not just a foreign brand using 100% Italian ingredients to make its pizza, but also a whole set of, precisely, Unexpected experiences that people can live thanks to Domino’s. As a matter of fact, the first touchpoint we have developed is the Domino’s Pizza App, where, just to mention the most interesting features, you can order pizza in four different ways: by reading the traditional menu, by selecting each ingredient to create your own pizza, by experiencing the most innovative ways to order: Pizza Match and Lucky Pizza. The font we used for the Domino's Pizza App could only be named Pizza Press: specifically created and customized for the brand. The fonts can be layered in many ways in order to add flexibility, diversity and impact to the brand’s voice, through visual effects. We studied the brand to create a graphic style that tells more about Domino’s identity, positioning, and what he really wants to communicate: a unique, innovative and different experience. While keeping Domino’s brand identity original colors and graphic treatments, we used and enhanced the following colors: wood, charcoal, blue and red. Who said that our soul mate has to be a person? Thanks to Domino's it can be a pizza too! Pizza Match is a Tinder-style interface, based on a native gesture that can now be considered part of our digital habDits: the swipe. Feeling creative? Pizza Builder is the best way to express your creativity! By selecting the icons of the ingredients through a simple "tap" you can create your favorite pizza. And if you're proud of your pizza, name it as you want! Can’t make up your mind? Are you curious? Try Lucky Pizza! An option that meets everyone’s needs: through a random-based system you can choose your pizza and receive discounts or win an "add-on". Mainly used as part of the on-boarding experience, the illustrations create a pop atmosphere within the application. 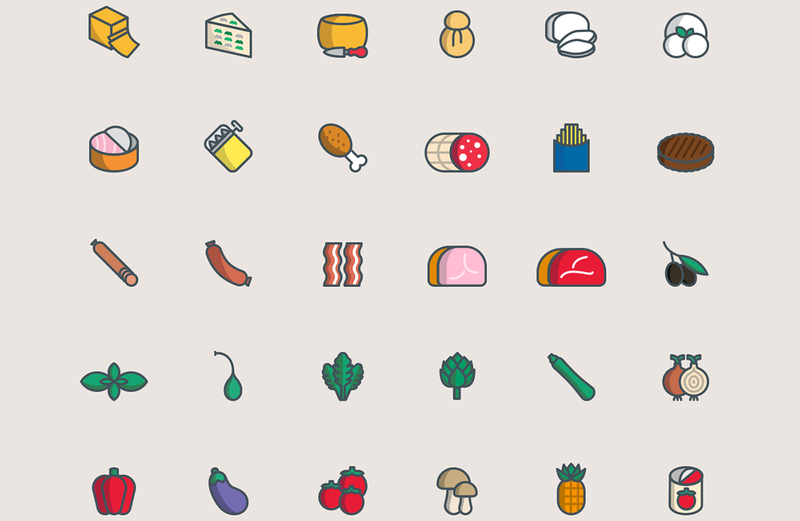 This particular style is given by over 70 hand drawn icons that recall an emoji-friendly and digital world. Designed with love by Alkemy. Currently available in Italy. Pss… Download the app and you’ll get a coupon for a free pizza! An unexpected experience is not only a foreign brand making pizza with Italian ingredients but also a mix of experiences that people can live thanks to Domino's Pizza. And thanks to this App.